This hut replaces the old Mt Brown hut which was removed by DOC in 2006. 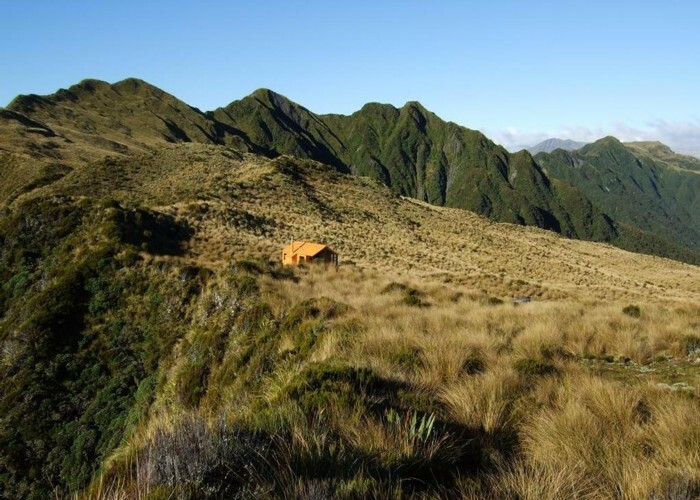 The hut is in a new location, high on a ridge overlooking Lake Kaniere. The new hut is the result of a community project lead by Eddie Newman and Julia Bradshaw. DOC donated the old Lower Arahura hut, and oversaw the new site selection & building plan modifications. Eddie & Julia mobilised volunteers, sponsors & donors to get the old hut demolished, the new hut built and to get the track recut. The hut was officialy opened on 10 December 2010 at a virtual opening held at the Beach Front Hotel in Hokitika. Andrew Buglass (the founder of Permolat / Remote Huts) cut a piece of cruise tape draped across a projected image of the hut with a pair of pruners and declared the hut open. Mt Brown hut & Newton Range April 2013 • By glennj. Licence: C.
No charges, but donations toward maintenance are appreciated. These can be made into the Mt Brown Hut bank account at any Postshop or handed into reception at the Hokitika Museum. Added 30 December 2010 by glennjglennj. 7 revisions, most recently 17 January 2017 by MatthewMatthew.